Further Questioning Oral Communication Strategy Instruction From a Different Perspective: Is Implicit Learning Possible? This study aims to investigate whether it is possible to learn communication strategies (CSs) implicitly through EFL teachers' modeling. In the context of EFL classrooms, non-native EFL teachers are supposed to use CSs through which they are also supposed to model the CSs in their classes. Although the literature has an agreement on the fact that strategy training should be explicit, there is no empirical study found focusing on implicit strategy training. Therefore, this study aims to investigate to what extent EFL teachers' use of different communication strategies in the classroom predicts the communication strategies by students. The data of the study was collected by means of quantitative and qualitative data. As for quantitative data, participants were asked to fill into Oral Communication Strategy Inventory (OCSI). For the qualitative data, on the other hand, data was collected through structured interviews. The results indicated that EFL teachers do not model CSs because their strategies in use are rather teaching strategies like simplifying the language. When specifically analyzed, the only CSs explained by EFL teachers' use was message abandonment strategy. The implication of the study is that explicit training strategy training should be provided for students' acquisition of these strategies, which is consistent with the literature. Bialystok, E. (1981). The role of conscious strategies in second language proficiency. Modern Language Journal, 65, 24-35. Canale, M. & Swain, M. (1980). Theoretical bases of communicative approaches to second language teaching and testing. Applied Linguistics, 1, 1-47. Cohen, A. D., Weaver, S. J., & Li, T.-Y. (1996). The impact of strategies-based instruction on speaking a foreign language (Research Report). Minneapolis, MN: University of Minnesota, National Language Resource Center. Dörnyei, Z. (1995). On the teachability of communication strategies. TESOL Quarterly, 29, (1), 55-85. Dörnyei, Z., & Scott, M. L. (1997). Communication strategies in a second language: Definitions and taxonomies. Language Learning, 47, (1), 173-210. Gass, S. M., & Selinker, L. (2008). Second Language Acquisition. New York: Routledge. Kavasoğlu, M. (2011). 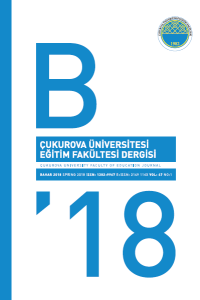 Oral communication strategies used by Turkish students learning English as a foreign language: the development of “oral communication strategy inventory”. (Unpublished masters thesis). Mersin University, Mersin. Mitchell, R., Myles, F., & Mardsen, E. (2013). Second Language Learning Theories. New York: Routledge. Nakatani, Y. (2005). The effects of awareness-raising training on communication stratregy use. The Modern Language Journal, 89, (1), 76-91. Nakatani, Y. (2010). Identifying strategies that facilitate EFL learners’ oral communication: A classroom study using multiple data collection procedures. The Modern Language Journal, 94, (1), 116-136. O’Malley, J. M., Chamot, A. U., Stewner-Manzaneres, G., Russo, R. P., & Küpper, L. (1985). Learning Strayegy Applications with students of English as a second language. TESOL Quarterly, 19, (3), 557-584. Oxford, R. L. (1989). Use of language learning strategies: A synthesis of studies with implications for strategy training. System, 17(2), 235-247. Plonsky, L. (2011). The effectiveness of second language strategy instruction: A meta-analysis. Language Learning, 61(4), 993–1038. Tarone, E. (1981). Some thoughts on the notion of communication strategy. TESOL Quarterly,15, (3), 285-295. Williams, M., & Burden, R. L. (1997). Psychology of Language Teachers. Cambridge: Cambridge University Press.